Let me start by saying am not an Apple hater! If you like Apple products, that’s great, keep using them. But they’re just not for me. Having said that, I don’t hate on you, Mr/Mrs Apple user, so please don’t hate on me for my preferences. This series of posts is not intended to bash on Apple, simply to highlight the tools that I use on the platforms that I choose to run. I’ll start with the tools I use in the office, both at work and at home. It’s reasonably priced and has all the power I need for my day to day work. It comes installed with Windows 10 Home, which I promptly removed and replaced, but more on that later. At the office I connect it to a larger external monitor as my primary display and the laptop becomes my secondary. It sits on a stand and I also use an external keyboard and mouse. At home I just use it as is, with the addition of a wireless mouse – I dislike touchpads. I’m not an Apple user, but I don’t use Windows either. Xubuntu is what’s called a Linux distro (distribution), a “flavor” of Linux. Its actually based on another distro called Ubuntu, but it uses Xfce as its user interface instead of Unity that comes installed with Ubuntu, which I strongly dislike. I find Xubuntu to be extremely light weight and fast. Where Windows has always been clunky and unreliable, your mileage may vary. UPDATE: I ran into a problem with Xubuntu a while back. The system would boot up and run, but anytime the hard drive was written to the system would crash. If this wasn’t my professional/work computer I may have worked through the issues, but since I need it to be reliable I switched back to Windows 10. It has actually surprised me quite a bit, its a huge improvement over previous versions. All other software I use remains unchanged. Using Linux does mean having to find replacements for more common applications on Windows or iOS, but that doesn’t mean they’re not as powerful, oftentimes they’re on par if not better than the more mainstream. Most software on Linux is open source (free) just like the operating system itself is. Again, don’t let that word “free” fool you, they’re still very powerful. There are packages out there that cost, but by and large they will be open source. The developers would certainly appreciate donations if you find their software beneficial. I like Xiphos because its just a solid performing software with great support from the developer. Its based on the Sword Project’s module system. Most of the library you can access through the Sword Project is public domain, so the materials are older and not as vast as you can get through Logos or Accordance. I have several Bible translation modules installed, all in synced tabs in the main pane of the program. When you move from tab to tab, the tabs stay synced to the same passage. Strong’s Greek and Hebrew displays in a small pane to the lower right on my “standard” translations while I usually have Clarke’s Commentary on the right side bar. You can configure the support panes based on the translation, so when I’m using the ESVS (ESV w/Strong’s Numbers) the right pane shows a larger version of Strong’s Greek/Hebrew instead of Clarke’s. I use Google Apps for pretty much everything document related. Its all based in Google Drive, so everything I write in Google Docs: devotionals, lessons, sermons, papers for school, etc, are all automatically saved in Google Drive. This is awesome when I’m co-teaching a class or work with other folks on material like camp or VBS, because sharing is ridiculously easy in Google Drive. 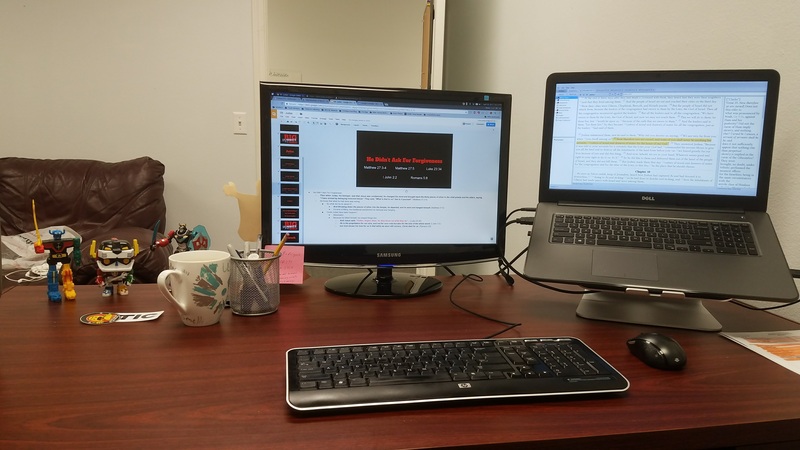 I also use Google Slides for my presentations for Bible classes and sermons. Google Sheets is comparable to Excel. Importing from and exporting to other formats is great in Google Apps as well. 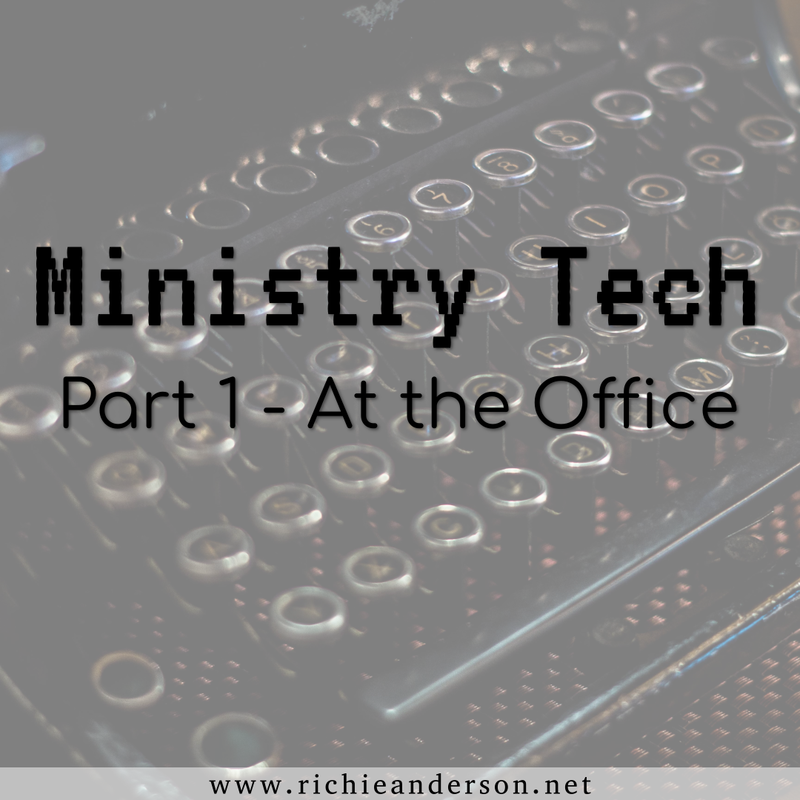 I have exported Slides to PPT several times for sermons and only had to make minor tweaks. I generally export to PDF for school work. There are other office type programs out there than run on the system rather than online in a browser like Google Apps. Libre Office is probably the biggest one. Inkscape is a vector drawing program, similar to Adobe Illustrator. I use Inkscape a lot, like, a lot a lot. I use it for my presentations in Google Slides, for graphics on my congregation’s Facebook and Instagram pages, for activity flyers, for the graphics on this site, and more. Gimp is a raster drawing program, similar to Adobe Photoshop. Most of what graphics work I do is in Inkscape, but it doesn’t print well, so I usually end up exporting to PNG from Inkscape and opening it in Gimp to print. Gimp is also far better for editing photos than Inkscape. Scribus is a desktop publishing program, similar to Adobe InDesign or Microsoft Publisher. 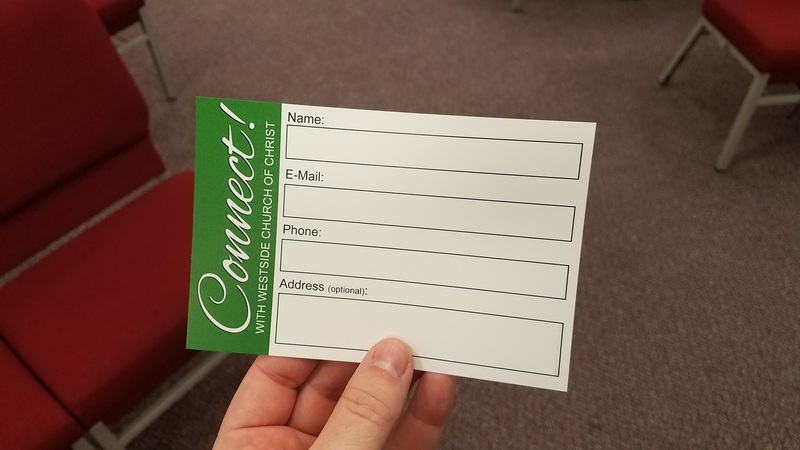 I have been able to do most printing from Gimp, but I did design our new contact/connection cards in Scribus. I just exported them to PDF and sent them to the local printer and everything turned out great. Those are really the big ones you’d have to get used to in a switch to a Linux environment. There are other things I use that are either the same or very similar to Windows/iOS, or are Linux specific tools that I prefer to use over the ones included in the distro I’m using. Here are some odds and ends I use that should be familiar to most people: Google Chrome, Firefox (occasionally), Thunderbird (email), Google Earth, Audacity, VLC, FileZilla (FTP), etc. Next time we’ll look at mobile devices and apps. Time for a less explosive project. I can't think of a much better way to spend Easter weekend than with these young people at Camp Hensel! Not a very good video, but here are the first two shots of this new rifle. All finished! I'll probably add a red dot and a sling, maybe a light, but the basic work is done. My first real "Falcon bite", and my first time ever hitting my head on a flight control surface, F-16 or F-15. I was sweeping around the jet at the end the day with my head down and walked right into the flaperon. Charging handle temp installed, still need a bcg.